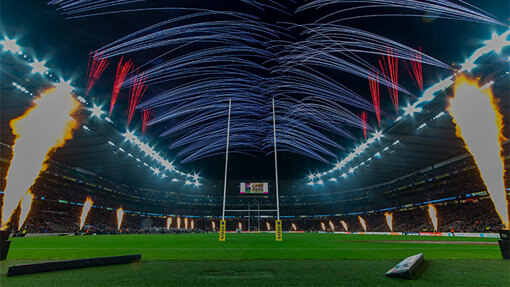 The Big Game is an annual rugby union match hosted by Harlequins during the Christmas holiday where they move from their home stadium at The Stoop to the National Twickenham Stadium, just a stones throw away. 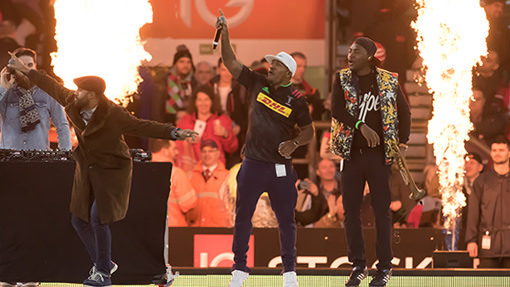 Harlequins have created a hugely popular event with a variety of entertainment as well as the rugby itself. It’s so popular it has broken numerous records including in 2011 global rugby union attendance record for a regular-season club fixture with 82,000 people. They don’t hold back with the Special Effects either, we’ve created some show stopping player entrances. 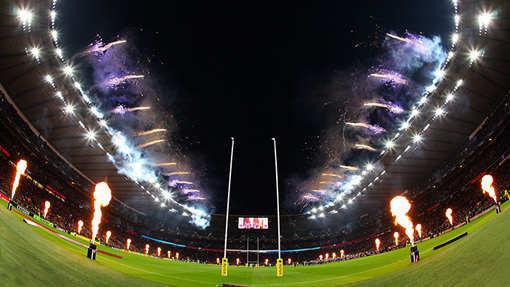 We’ve been working on the event for 7 years (Big Game 3 – 9), so the main challenge for this and any other annualised event is creating a point of difference from one year to the next so that you can provide a different production for the client and the thousands of rugby fans and make each year more memorable than the last. The easiest way to improve on the previous year is to add more products, making it bigger and better so for example we’ve increased from 6 flames on one side of the stadium, to 24 spread across all 4 sides of the pitch providing full coverage. There is an optimum amount of product though, you reach a point where additional product no longer adds any extra impact. Or there simply isn’t any more space available. Utilising different firing locations is a great way to add variety and depth to a display. You can also create a surprise element, by firing products from locations the crowd won’t expect. For some events we fired from the pitch level, on other occasions we fired from the roof and most recently we combined the pitch and roof levels for our biggest production to date. We’ve sourced improved products which has helped us develop the show design’s. Flame machines have developed from units only providing 10 bursts to state of the art systems enabling us to provide 60 second duration displays where the jets pulse in time to the music. We’ve also sourced much larger pyrotechnics which now when we fire them out across the pitch, they meet in the middle. The atmosphere within the stadium speaks for itself, nerve tingling excitement, the hairs on the back of your neck stand up. The overall event production is worthy of a World Cup Final. To find out about the individual products used as part of our pyrotechnics services, please click the image below.